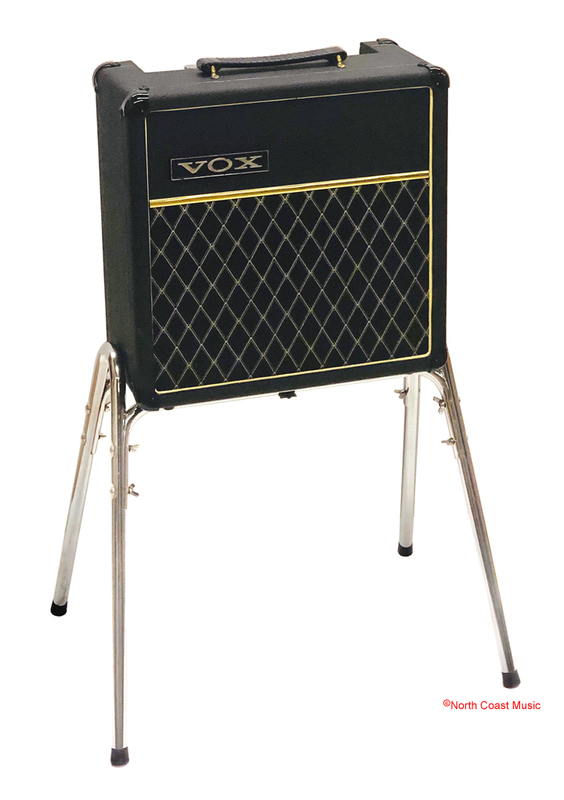 Thomas Organ initially introduced the optional S-1 rigid stand for the tube version of the Vox Pathfinder amp in the September 21, 1965 US Vox price list. Shipped unassembled, the S-1 rigid stand kit included two inverted tubular "V" tubes, two tubular cross bars, eight carriage bolts and eight wingnuts. A small steel bracket and a wingbolt mounted the bottom of the amplifier to the stand. The optional S-1 stand was priced at a retail price of $10 in the 1965 US Vox catalog. For the July, 1966 Vox catalog, Thomas Organ offered the S-1 Pathfinder stand and single button tremolo footswitch in a "mandatory" bundle costing $6 under the model number V501. The solid state V101 Vox Pathfinder amp, stand and foot switch retailed for $94.40. The November 1966 US Vox price list offered a new model number, V1011, for the solid state Vox Pathfinder amp, stand and foot switch. The package price increased to $120. The only source for the S-1 Vox Pathfinder stand is the used and vintage market.